Following the success of the Dublin City Council Cycling Challenge we are launching three new SBIR competitions in partnership with Enterprise Ireland. We are looking for smart and low cost innovative solutions to tackle illegal dumping, to monitor and predict blocked gullies in high risk flooding areas and to design wayfinding solutions in the Dublin region. Successful applicants will be selected by an open competition process run in two distinct phases: feasibility and prototyping. The call is open to anyone with an idea or solution – including organisations of all sizes, tech- developers and innovators, solution/service providers, universities and entrepreneurs – with up to €600k in funding available. 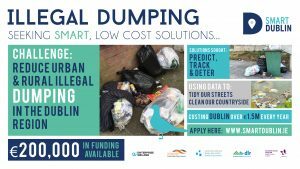 Illegal Dumping– Seeking low cost, innovative, technological solutions in the form of products, services or applications to tackle illegal dumping in the Dublin region. Click here for more information. 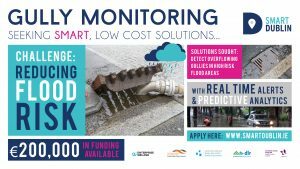 Flooding – Seeks low cost, innovative solutions that can monitor and predict blocked gullies in high risk flooding areas of Dublin. Click here for more information. 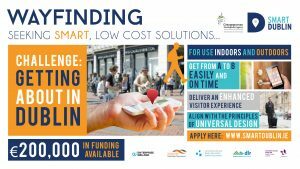 Wayfinding-Smart Dublin and the Grangegorman Development Agency are seeking low cost, mobile, smart, innovative, universally designed, indoor and outdoor wayfinding solutions. Click here for more information. There was a briefing session for all prospective applicants on the 12th May. It provided the opportunity to discuss the requirements of the brief with Enterprise Ireland, Smart Dublin and the Grangegorman Development Agency. The three challenges are open for application from 27th April until 12th June at noon.